Operating a motor vehicle on the roadways will always carry some risk, and car and motorcycle accidents do happen. To reduce this risk, vehicle operators must conduct themselves according to a reasonable standard of care to ensure that not only do they not put themselves and their passengers in a dangerous situation, but that they do not, by their actions, cause a dangerous situation to exist for other vehicle operators. When that motor vehicle is a motorcycle, however, Florida law has different requirements than those applied to four-wheeled vehicles. Recently, a Belleview motorcyclist was killed at an intersection in Wildwood after being thrown from his bike after colliding with an automobile. Although the result of this accident is a tragedy, it does illustrate the unique risks of operating a motorcycle. Accordingly, a discussion of some of the unique aspects of operating a motorcycle on Florida roads will follow below. Florida helmet law is not as cut and dry as many believe. There is a requirement motorcycle operators and riders wear a helmet, but it is possible to opt out of the law if a rider is over the age of 21, and can prove he/she has $10,000 or more in medical insurance coverage. An additional requirement is eye protection. Unlike the helmet law, there is no exception to this requirement, and everyone traveling on a motorcycle must wear sunglasses or goggles to protect their eyes. Motorcycle operators are expected to follow the same road rules as operators of automobiles. This includes the same traffic laws, which means that motorcycle operators cannot split lanes with other motorcycle operators, nor does it mean that motorcycle operators can weave between lanes of traffic. This type of behavior is typically used to argue that motorcycle rider is at least partly at fault for any resulting accident and injuries. PIP Coverage. Although not required, and, as such, not regulated, insurance companies offer motorcycle PIP coverage. Since it is not regulated, the coverage is governed by the terms of the insurance contract which can vary. Property Damage Coverage. This coverage protects a motorcycle operator if he/she damages someone else’s property through negligent operation of his/her motorcycle. Bodily Injury Liability Coverage. 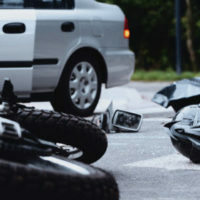 This coverage, when held by the person determined to be at fault, is intended to cover medical bills, lost wages, and pain and suffering of a person injured in a motorcycle accident. Uninsured Motorists Coverage. This type of coverage will protect the policyholder if the at-fault party has insufficient bodily injury liability coverage. If you was injured while operating or riding on a motorcycle, contact the Miami law firm of Pita Weber Del Prado as soon as possible to determine whether you can recover the expenses of you injuries. You should not be solely responsible for these expenses if someone’s negligence is at fault. The attorneys at Pita Weber Del Prado have experience in addressing liability for motorcycle accidents, and will fight for a fair result. Contact our Miami office today for an initial consultation.